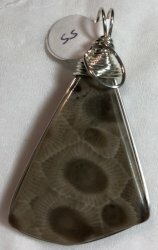 It is wirewrapped with sterling silver wire, ready to put on your chain. It measures overall, approx. 2" x 1-3/8" including bail.